How would this compare with the ROG tri-vibe ? there is a you tube video of all 8 of the 1590g builds . This sounds fantastic . its got a really great univibe warble and throb. Thanks Alex for doing this one .ill verify it this weekend or sooner. 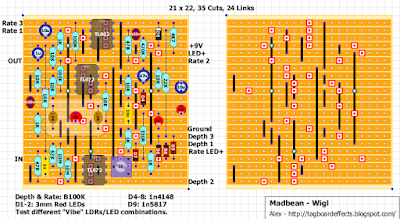 (Actually there is a verified layout for the Moar pedal in the forum). well i cant get the lfo to work. i have checked everything several times .. i must have a bad part idk. i might try building it from scratch again. it only took three hours to build and i have 4 in troubleshooting. i got 1.11 volts instead of four and none if the chip legs that are supposed to varie are . There should have been a double link there. ok i added the double link. i now have 4.1 volts where need be but i get no flash on the lfo no pulse. just a steady red light. i have now checked this board a dozen times. is it possible the original configuration damaged a part? is it possible we still have another issue with the layout? please look it over for me one more time . i cant wait to get this one going . Checked it again and I'm pretty sure the layout matches the scheamatic. I doubt something got damaged cause of the missing double link but... Is D3 not pulsing or the Rate LED? Have you try changing the ICs? Sounds great. Very chewy. Getting some ticking but I'm using a 072 as a temp sub. I'll try a 062 when they land and report back. Ramp up is slower than ramp down (triangle wave) so it gets a bit sea sick at higher rates. Currently going through LDR's but I think I'm settling on NSL19. I have to say I like this much better than the ROG tri-vibe. I only ever used the univibe setting on it anyway and found it tame enough. This has much more bite to it...and it fits in a B box! Strasser.....i found that the trimmer has a definite small sweet spot where the pulse is full light/dark. Either side of that and it makes subtle pulses. Also with the depth fully CCW there is no pulse at all. Maybe look here for your problem? I also had to reflow my IC sockets before it kicked in. the top right 100n was bad . i didnt do a continuity check because i had no bridges . once i did a continuity check i discovered it. figures the first time i use greenies to save a little money and i paid the price. i guess ill never use a greenie again without checking it first ha ha.that cost me two hours last night and a half an hour tonight. Brand new bad will kill ya. to late to plug it in for a demo and tweaking but voltages are all good and i have a pulse. thanks guys . im sure its good to go now. you guys rock I appreciate it. i knew i had a bad part even the other night before the VB fix.what are the odds? 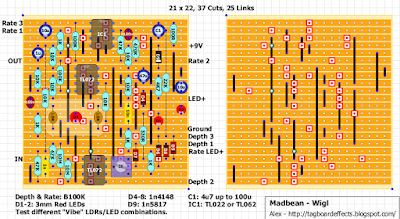 i have had one bad resistor and now one bad cap in 80 builds. the worst was the counterfit ca3080a i got . i spent three nights trying to figure out why my dyna comp wouldnt work. Great news Strasser! When you get a chance to listen can you report back on ticking? I used a TL072 and I'm waiting for a 062. I'm preparing myself to modify my build to include Mark Hammers ticking solution....if I need to that is. It is great news thank God that bad cap showed up as continuity. I was snowblind from checking that board three nights in a row . Ill fire it up tonight for sure. I had a ticking issue with the boss Ce-2 chorus here and Frank_NH helped he redid the layout so I was getting separate power for the lfo. Thats in the forum under boss ce-2 ticking. Where can I read about Mark Hammers ticking solution? I have a tl062 and I have tl022 if need be Ill let you know. Man I really hope this doesn't tick I have way to many hours in this one already ha ha. Mark Hammer solution in a nutshell....isolate LFO IC power from the rest (basically install a 100r resistor between 9V and pin 8. The rest of the board gets 9V before said resistor. Install a small filter cap 4u7 to 10u on LFO IC power to ground to act as a reservoir for the LFO current rush. So I replaced my 072 with a 062 and the ticking dramatically reduced. Did the mods listed above and its practically gone! Still ticks with hi gain circuits but for my purposes its near silent. Result! is that what you've meant? Hey Ciaran, could you show me were to put the small filter cap from ic lfo power to ground. I have added the 100R, just not sure were to put the cap. Thanks. Add a link from the 10u cathode to old 9V row. Replace the protection diode with the small filter cap. Anode to top row, cathode to Row 4. I don't use polarity protection so I removed the diode just to have space for the cap. Where is your 100r placed at the minute? I put the 100r from the top right hole to the same hole as the 9v input, but your solution looks easier so i will do that. OK done. Thanks Cairan. Kept the 4k7 and LED in place by placing insulated wire from 10u cathode to old 9v so could still have indicator LED. Nice vibe. I used the bog standard LDRs from Bitsbox and they seem to work fine. How about the full easy vibe with the anti ticking?? Hey how bad was yours ticking mine isnt that bad.Its not perfect but you couldnt hear it while playing . is it perfect now? It wasn't bad at all. But since doing the isolation trick above its now silent when playing clean and near silent with high gain. A definite improvement for me anyway. i just modded my first layout to the second and lost my pulse . unless i have another bad part i dont think version 2 is right. hmm i left that little part the way it was since there is a hole were the link would go so i put a solder bridge from pin 5 to the row below so its still seperated going right to left the original cut is still blocking and the solder bridge is my link That should work right? Thanks a lot for this layout, it's a great sounding vibe. I build the version 2 with the mod, I used a TL062 and a 10uF for C1 and it works like a charm. I didn't use it a lot for the moment but I didn't hear ticking sound. For me it's can be tag verified. Thanks a lot for all the work. Thanks Thomas I am glad you verified it . I must have a mistake on the mod from build one to build 2. Sorry alex ha ha. Maybe easier to build version 2 directly (what I did) than converting version 1. I bought some VTL5C3/2 vactrols by mistake a while back (they have 3 LDR terminals instead of the usual 2 - datasheet at http://www.excelitas.com/downloads/dts_vtl5c2232.pdf). Anyway, this circuit works really well using one of these with the centre tap LDR going to the common (lower strip) connection. Probably just as easy to roll your own ldr/led/ldr combo, but it's an alternative if you have a vtl5c3/2 to hand. 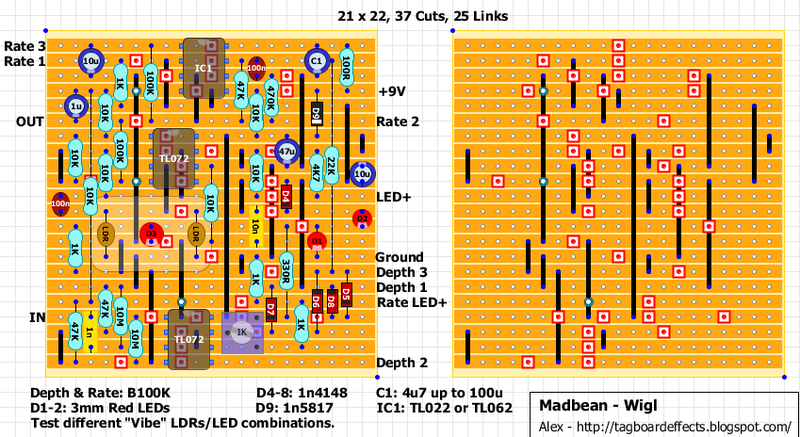 Hi , Does the Madbean version have a stronger un vibe sound then the John Hollis build , or are there pretty much the same. 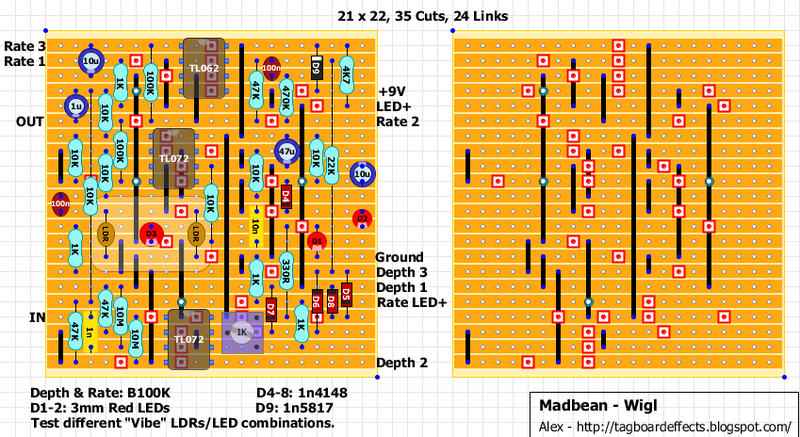 I am a bit lost , the Rate+ LED Wire and LED+ on the board ,where do I run wires . Can I connect them both stomp switch . The best way is to run both -ve ends to the stompswitch. But if you want the rate LED on all the time even when pedal is bypassed then run its -ve to ground. I am getting no vibe whatsoever and I have low output and its very distorted, I've built the second version, anyone had similar problems? Must be a mistake I made, just build the first layout from scratch and it sounds AMAZING.